The 2008 AGA Convention in Atlanta, Georgia was a whirlwind of an event. Of all the stories I have told from that weekend, the one of Kirsten Eidsmoe is one of my favorites. I was lucky enough to be sitting next to Mr. Amano at the time that Kirsten approached Mr. Amano. I sat there in amazement as Mr. Amano asked if he could come to Kirsten's house to interview her for Aquajournal #159. 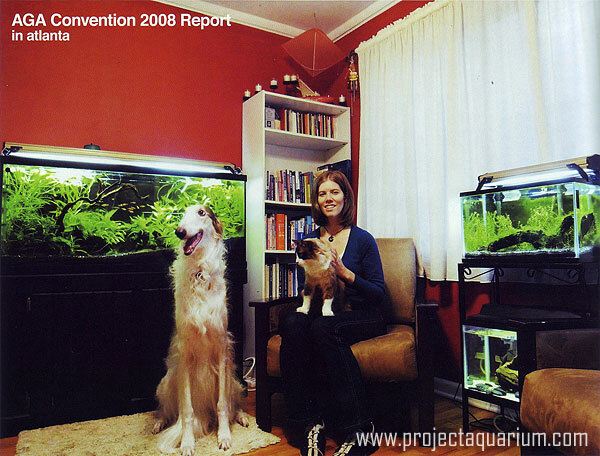 I recently reached out to Kirsten to see if she would share her account of the meeting with Mr. Amano, the AGA Convention, and planted aquariums in general. Favorite Aquascapers: I'm still so new I'm in awe of everyone! My two favorite things are animals and art - how great is it to find a hobby that encompasses both? 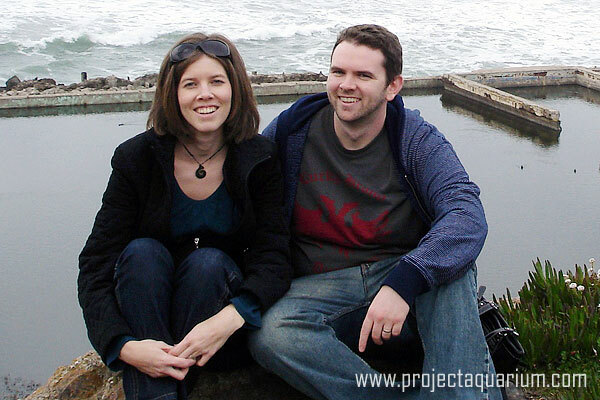 My husband Chris is very much involved in the aquarium hobby too - he's just not as chatty. I'm the one who gets obsessed with a certain species of fish and reads the entire internet for information, and Chris is sensible one who says it's time for a water change. It seems to be quite rare to have both halves interested in the hobby, and I really appreciate having someone to bounce design ideas off of, or someone to throw the CO2 regulator instructions at when I can't figure it out. What are your favorite books? Movies? Music? Games? Food? I'm such a snob, I annoy myself. I watch a lot of Independent Film Channel, listen to college radio, and read any 20th Century international fiction that hasn't shown up on Oprah's list. But really, I like well-crafted art of any genre. If it's a blockbuster movie or a pop song that's done really well, I appreciate that too. I think it's why I enjoy aquascaping so much. An ugly aquarium just kills me, because there's so much potential that's being wasted! Oh, I should add that my alltime favorite movie is Annie Hall. Every scene is absolute perfection. I have two copies so I can lend one out and still have the other just in case. Do you create any art yourself? I drew my first picture when I was two, and I have it framed and hung on the wall. Most of what I've done since is either quite literal, or an homage to something else, and entirely done to entertain myself. 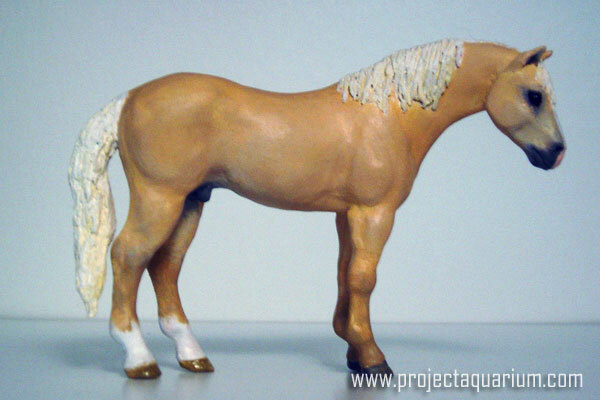 The horse sculpture was a portrait of my dad's horse who died suddenly - it's about 4 inches tall. The collage is my version of Edward Hopper's Nighthawks, using the Seinfeld characters. It's made up of about a year's worth of Entertainment Weekly magazines. I don't think any of my art says anything "important" - it's just quirky, and I like it for that. How did you get into aquariums, planted aquariums in particular? It was the old free aquarium trick. A month after we got married, a friend of mine also tied the knot, and his new wife made him give away his aquarium. It was a pretty nasty 20 gallon with a large pleco still living in it. We actually got very good advice at the LFS we happened upon. The guy asked if we were interested in plants, and showed us some of the Takashi Amano books. Chris was really the one pushing the planted tank idea. I can't even keep cacti alive, so I didn't really want to spend the money on something I was sure would die. Turns out, it's impossible to forget to water aquarium plants! How do you approach planted aquariums? We do all high tech tanks, but it's just because that's how we thought it had to be done when we started out, and I like everything to match. I'm still trying to find my aquascaping voice, but what I try to go for is something between a nature aquarium and a biotope. I love the nature aquarium aesthetics, but I also want to create an ideal environment for my fish, and if you keep specialist fish, sometimes the two are at odds. So it's not quite like sticking your head underwater, but it's also not a miniature underwater landscape. I'd like to think my aquariums are like sticking your head underwater and thinking "hey, Mother Nature applied some design principals down here!" I'm still working at it, of course. So I guess I should mention here that I specialize in loaches, with some other Southeast Asian fish thrown in for color. The loaches are such active bottom dwellers that it kind of limits what I'm able to do in terms of ground cover and substrate, but their personalities are unbeatable. So when I'm designing a tank, I'm usually designing it around a specific species of loach. The challenge is to meet all of their needs in terms of hiding places, current, shade, substrate, etc, and then try to make it beautiful. We originally had the loaches in tanks that looked more Dutch, and it just didn't feel right. We just kept rescaping and rescaping until the fish looked like they belonged there. What challenges did you have when starting or continue to have with planted aquariums? I've had nothing but challenges! Probably the biggest thing was getting over my mental block against growing any sort of plants. At the moment we've scaled back to only three tanks, but each has its own problem. In the newest one, we're battling algae while we try to get the nutrients and light cycle right, in another our SAEs have started chewing up all the hygro, so I think I'm just going to have to come up with another plant. The third tank is all crypts and Java fern that I didn't expect to grow so big, so now I've got to figure out how to trim it back to the look I wanted. Once that's all sorted, it will be something else, but that's the fun, right? Right? Do you have any favorite aquascapes that have inspired you or continue to amaze you? Aquascapes that really grab my attention are usually the ones that use only a couple of different types of plants. I'm especially drawn to aquascapes using ferns, mosses, grasses, and crypts - I like the way they grow as opposed to stem plants. I also love good use of negative space. 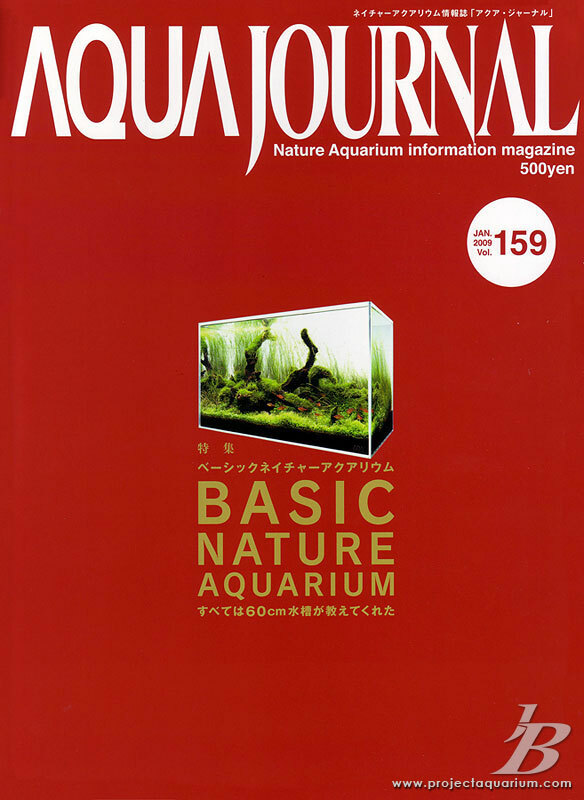 When we were first starting out, there were a couple of aquascapes in Nature Aquarium World Volume 1 that stood out to me - on pages 76-77, if you're following along, "The Invisible Waterfall," and on pages 134-135, "Touches of Color." 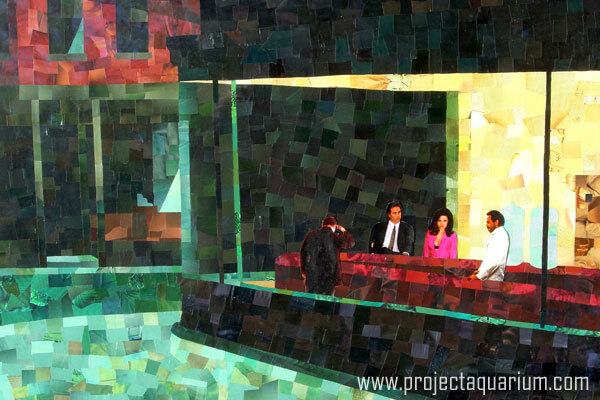 But when I'm trying to impress family and friends with what's possible in an aquarium, I always trot out that 2007 AGA Aquascaping Contest winner, "Syrah" by Filipe Alves Oliveira. It's an inventive concept done amazingly well. I love it when someone is both daring and successful. Can you tell us how/what led up to you being chosen to be featured in ADA Aquajournal? Well, lets just say Mr. Amano asked for the interview before seeing the tanks! He was at the AGA convention here in Atlanta. I really just wanted an autograph, but I'm shy. I asked a fellow Atlantan to introduce me so I could get my book signed, and I guess he gave a more impressive introduction than I deserved. It's all a blur beyond that. Apparently, Mr. Amano features a different 'woman in the hobby' in each issue, and he wanted to include someone from Atlanta since he was in town. I just remember him asking, and me taking a quick mental tour of the state of our tanks and thinking, "oh no, this is not a good plan at all!" I'd been so busy lately, I'd just let the tanks go. I was planning to deal with it after AGA! But you can't say no to something like that, right? So Chris and I stayed up until about 5am water changing, trimming, reaquascaping, and stuffing clutter into closets. What was it like to interact with Mr. Amano in your home on such a personal level? It was pretty strange! Looking through Mr. Amano's books was my first introduction into planted aquariums, so it was a little too perfect that he was the first person in the hobby to see our tanks. At some point, I just stopped stressing out and told myself, "I'm sure he's seen worse!" Mr. Amano was extremely gracious, and the whole experience was surreal - compounded by the fact that I was so exhausted from the night before. Half my brain was distracted by those smudges I'd missed on the front of the aquarium glass, and the other half was trying to figure out how I would explain this to anyone later. That didn't leave much to focus on answering questions coherently - hopefully he was able to work a little "Amano Magic" on the interview! I was also not expecting him to be interested in our other pets. 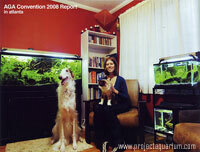 We have a borzoi (Russian wolfhound) and a ragdoll cat. Mr. Amano knew what a borzoi was, which completely won me over. He wanted them in the pictures, so a lot of photoshoot time was spent trying to get the animals to pose. I was really pleased with how those photos turned out. How did you explain it to other people outside of the hobby? It usually starts with "ok, so you know we have these aquariums, right?" I've said before that it was kind of like Picasso finding out you finger paint, and asking to feature your work in his art journal. And there you are saying, "no no, I don't think you understand, I said 'finger paint'!" It's hard to come up with a corollary - there aren't too many industries where there's only one big name. For the most part though, people outside the hobby have been excited about it, and of course people who do planted tanks know what an honor it was. The hardest thing is trying to explain it to people who specialize in other areas of aquaria. 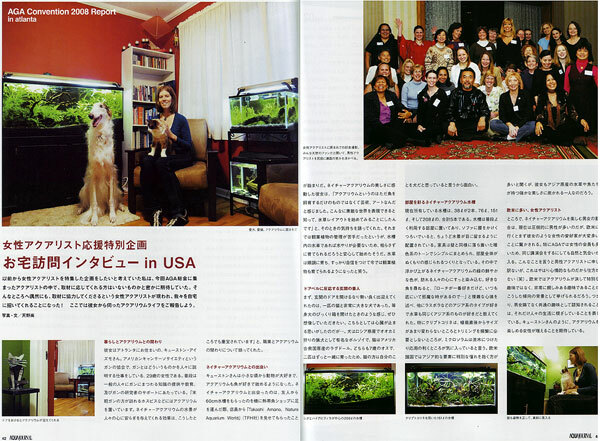 A lot of the people in our local club don't know who Takashi Amano is, so they thought it was cool that I was in a magazine, but weren't exactly star struck. What did you think of the AGA convention in Atlanta? I was completely blown away by the talent, knowledge, and friendliness of everyone there. Everyone I spoke with was so excited to be there, and so genuinely happy to both teach and learn. I guess it sort of prepared me for meeting Mr. Amano, because I was already feeling so outclassed, why not go all the way? The conference really helped me put the hobby into perspective. I feel like I've learned a massive amount in the past four years, and it's exciting to see so many people further along in the hobby and to realize how much more there is to it. Also, when you're deeply involved in such a specialized hobby, it can get a little lonely. The internet is great, but wow, conferences are awesome! Do you visit the Georgia Aquarium often? I'm a season ticket holder, but I don't go nearly as often as I should - especially considering that I work across the street. I lead the AGA field trip to the Aquarium, and was one of the first ones inside that morning. It was a pretty eerie feeling walking through the empty exhibits. And those whale sharks just never get old. Was there a part of the convention that you felt really helped you or stood out….aside from the Mr. Amano interview? The demonstrations - both Mr. Amano's demo and the Iron Aquascaper's competition were incredibly helpful to me. I picked up a lot of techniques that I'm excited to try - some of which seem pretty obvious now that I've seen it - like tying ferns to small rocks and then positioning them in the tank. The other most valuable thing was finding out other people in our local aquarium club were interested in planted tanks. The club has never focused much on plants, but now that we all know we're not alone, it's making the club stronger. Do you have any goals in the hobby for the next year or two? We set up a new loach tank this winter using all grassy plants, so for now my two goals are to keep the Isoetes alive, and to not get any more tanks until we have a new house to put them in. Our local club recently started a new Horticulture Award Program, so we're working our way up through that right now too. I just found a flower, and the red tiger lotus has propagated, so I'm feeling pretty good about myself right now! The challenge will be to propagate every species we have right now, because I don't want to mess up any aquascapes just to squeeze in a few new plant species for the HAP points. That means the Isoetes better not die on me! Beyond that, I do want to set up a non-loach tank and try an iwigumi layout that would otherwise be impossible. I'm just not sure how long I could commit to a tank without loaches.